It probably all began on a hot summers day when one of Southwest Florida's Native American Indians cast his gaze out over the Gulf of Mexico and marveled at the sight of a gigantic silver fish propelling itself completely out of the water. I can imagine the feeling that this image must have invoked, as to this day I still get a tingle up my spine with every leap made by the might Silver King. The concept of trying to catch one of these mighty brutes I'm sure caused many to wonder and question the probability of hooking, subduing and then actually landing a fish of such phenomenal size and strength. I am sure this was a topic of numerous heated discussions among the early anglers and although no one knows for sure who actually landed the first Tarpon on the southwest coast of Florida we do know that it was accomplished with a twisted cotton hand line. What battles they must have been, having only a pair of leather and cotton gloves as protection from the blistering runs of the Silver King. As the sport progressed into the mid 1800's the advent of the rod and reel came into play. 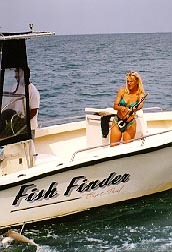 The first successes were accomplished with a typical outfit consisting of a twenty five dollar, one piece, six and a half foot rod, with agate guides and tip, a big forty dollar reel, a four dollar twenty-four tread line, two hundred yards long tested to forty eight pounds and a one dollar hook usually dressed with a strip of fresh mullet for bait. From the onset the anglers knew that as the Tarpon felt the steel of the hook this fish had a propensity for skyrocketing from the water and ejecting both bait and hook high into the air. Even when an angler was lucky enough to actually survive this first burst of aerobatics and succeed in finding a place for the hook to imbed in the Tarpons bony mouth, then and only then did the angler truly understand not only the awesome strength but also the tenacious will to survive of the mighty Silver King. Soon the word spread through out the angling world and by the late 1800's anglers from around the globe were making their arrangements to come to southwest Florida to pit their skills against this mighty adversary. The only mode of transporation was the Flagler railroad and the most common destinations were Fort Myers and Boca Grande. 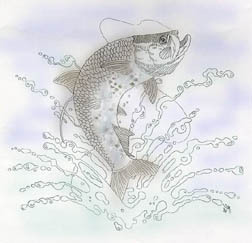 Once here it depended on your financial resources as to how you would fish for your Tarpon. Whether you stayed on your own yacht, rented a houseboat or stayed on land the most common method of fishing was to hire a boatsman. For a sum of two dollars on the low end to six dollars on the high end you could hire a boatsman to either paddle a canoe, row a small skiff or operrate a small skiff with a tiny outboard. 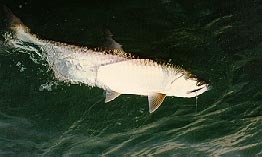 Anchoring and bottom fishing for Tarpon was considered the lazy mans way and trolling was considered the sportsman way. But either way, once the hook was set the real fun began and the method with which it was achieved became immaterial. From now on the battle was just a test of will, yours against that of the mighty Silver King. It is important to note that the times have changed. The tackle, boats and guides are more specialized and do cost a bit more now but the things that have not changed at all are the graceful leaps and the tenacious will to survive that set this one fish apart from the rest. It is because of this that anglers from around the world still flock to the legendary Tarpon haunts along Florida's southwest coast to once more test their strength and endurance and to more often than not be subjected to a lesson in humility from one they call the Silver King.